I am putting this out there after the recent thread on the vintage knife on eBay. I received numerous emails, pm's, texts, and phone calls about this knife. Too many. I even received a text message at 6:18 am!! Really? WTF!?! Also, don't call me to discuss a knife and then quasi quote me on a forum. I don't need any ghostwriters. I want everyone to understand, I do not and will not give the stamp of approval for any vintage knife without having the knife in hand. Period. That has been the Randall shop policy and I am bound by the same. This particular knife is the EXACT reason why it is important to have a hands on examination. There is too much to be gained and/or missed using photos alone. So next time something like this comes up, and I am always happy to discuss RMK's and help where I can, but don't ask me to give you the warm and fuzzy w/o seeing the knife. If you are questioning the knife and can't get a return guarantee, don't buy it. Perhaps the fact you are questioning it may be a sign? You guys are grown men, make a decision and live with it. Joe, as usual, you handle a prickly topic with a velvet glove! 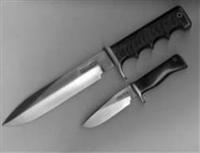 But you are correct, there are risks on unusual and older knives. If there is a hint of doubt seek advice. It's easy enough to post a question on any one of the forums or Facebook sites. The Randall community is honest and helpful. When a buyer gets burned by a bad deal, it hurts the hobby for all. I am now back on the forum. Joe, after seeing what you wrote I am thrilled that I never asked you for anything about the Hunter. I learned a lesson and sometimes lessons come with a price. That is OK. What I have gained is that so many people on the forum contacted me, and they understood that I did not know the faults of this knife, before I learned myself. I was helped by the forum guys. I never meant to be harsh or disrespectful to anyone. I just thought I had the real deal, and I did not. I want to thank everyone who contacted me, and express my gratitude. Dan, don't misunderstand, I don't mind discussing a knife, but I can't give a binding opinion (good or bad) on one without having it in hand. There was allot of behind the scenes stuff going on, at least for me, and some folks were almost demanding I give them the answer they wanted. I am obligated to follow the wishes of the Randall family relative to the knives that carry their name. It is that simple. Some were questioning me not taking a stand either way. I am in a precarious position because folks expect me to know or have an answer, but I can get thrust in the middle of something I don’t want to be in unless I can back up my position. I can't in good faith say a knife has issues using photos, then on the other hand officially say a knife is good using photos. Can't have it both ways. This type of stuff, like Mitchell said, is not good for the hobby. I don't like seeing it, particularly when the name calling starts. I have been involved in some heated discussions in the past, most often escalated by attacks on my character. So while I am here to help when I can, and in most instances you can tell allot with good photos, sometimes a knife comes around that really needs to be seen, and photos won't do. Your knife happens to be one of those knives. Dan, you have every right to be harsh....... The price you paid has benefited everyone on the forum. I'm sorry you were burned. We all get burned at one time or another, it goes with the territory. However, rarely are we raped by a supposed family member. Like Tune and most everyone else... sorry you got the stinky end of the stick on this one. dang, that made me hungry. And laugh. Good story.